Indigenous nations are on the frontline of the current climate crisis. With cultures and economies among the most vulnerable to climate-related catastrophes, Native peoples are developing responses to climate change that serve as a model for Native and non-Native communities alike. The new book Asserting Native Resilience: Pacific Rim Indigenous Nations Face the Climate Crisis presents perspectives on Indigenous responses to the climate crisis, reflecting the voices of more than twenty contributors, including Indigenous leaders and Native and non-Native scientists, scholars, and activists from the Pacific Northwest, British Columbia, Alaska, and Aotearoa/New Zealand. Today, volume editors Zoltán Grossman and Alan Parker talk with us about the inspirations behind this work, the relationship between culture and climate change, and next steps for Native communities and their allies in responding to the climate crisis. Why did you put together a volume addressing the climate crisis and Indigenous nations? Indigenous peoples and their leaders are being systematically left out of the global dialogue around how to respond to climate change, such as the United Nations Framework Convention on Climate Change. We are more likely to hear about an endangered polar bear than we are about the Inuit people living nearby, whose villages are slipping into the sea due to coastal erosion. And the few times we hear in the commercial media about Indigenous peoples and climate change, they are depicted as helpless victims, rather than as sovereign nations with their own innovative ideas and strategies about how to respond to the climate crisis. The Quileute and Hoh in Washington, for example, are moving buildings that house their tribal governments to higher ground and succeeded in having the US Congress authorize them to use part of the Olympic National Park to protect their communities from surging seas. The Nisqually are proactively moving their freshwater source to higher ground, in collaboration with the city of Olympia. Tribal responses such as these are increasingly providing models for their non-Native neighbors. Not that long ago, Indigenous peoples were often described as the “miner’s canary” of climate change, with the premature death of their cultures providing an early warning to the rest of humanity. But because of the important work of Indigenous peoples, they can now be described as a canary that escapes its cage, flaps its wings, and shows the miner the way to escape the toxic gases. In the Pacific Northwest, tribal responses to the destruction of salmon habitat have helped shape how tribes are responding to climate change, in a holistic and collaborative way. The Tulalip Tribes inspired us by being at the forefront of this thinking. The Tulalip are working with dairy farmers to turn cattle waste into renewable biogas energy, keeping it out of salmon streams. They are also exploring ways to store mountain runoff in the flood-prone spring months for release during low-flow summer months, in order to rehydrate the river basins and protect salmon habitat. On the West Coast of the US and in Aotearoa/New Zealand, Indigenous communities are providing emergency shelter in times of disaster to both Native and non-Native neighbors, because they have seen that local and national governments are not as proactive and hospitable. What do you see as the relationship between culture and climate change? Native peoples have the traditional ecological knowledge to recognize the changes in the local climate, with many generations of intimate contact with the local landscape and ocean. Indigenous peoples have the sense of community to pull together to face the challenges. Many Native nations possess the political sovereignty (including treaty rights) to be able to implement responses to protect our common natural resources. Native cultures have provided the inspiration and the tools for Indigenous peoples’ resilience in the face of colonization, epidemics, industrialization, and urbanization. Climate change is only one more sickness brought by Western industrialized society. The culture of individualism in Western society has led to shopping malls and mega-food chains making us all increasingly vulnerable to collapse of society in our era of climate change. We now see unprecedented levels of “super-storms,” wildfires, power outages, and water and fuel shortages. In such times of hardship, Native communities can strengthen and draw on traditional food systems, water rights, and kinship networks to hunker down and survive, and engage in planning for a more sustainable future. What is the Indigenous Nations Treaty and why is it important? In 2007 in the land of the Lummi Nation, Indigenous representatives from the US, Canada, Australia and Aotearoa/New Zealand gathered together to develop and sign the United League of Indigenous Nations Treaty. The Treaty calls for greater cooperation in the areas of trade, border-crossing rights, cultural resource protection, and response to climate change. Indigenous nations cannot simply rely on the “settler states” to act in their interest, especially when it comes to the tepid responses to climate change acted out today by the US and Canadian governments. The United League of Indigenous Nations Treaty is just one example of how Indigenous peoples and their political leaders are cooperating with each other across imposed colonial boundaries and treaty territories. As fish, animal, and plant species shift outside of their treaty territories due to climate change, Native nations face new challenges to access their traditional resources. One response is cooperation among Native harvesters, such as basket weavers who are starting to trade grasses and reeds with each other to keep access to their shifting supplies. What is the next step for tribal communities and their allies in responding to climate change? The first step is to end our country’s addiction to fossil fuels, such as from the Alberta Tar Sands, and to start planning now for a cleaner and sustainable energy future. No matter what else we do, it will be irrelevant if the fossil fuel monster grows in size. But even if we convert to renewable energy tomorrow, we will still face inevitable effects from the greenhouse gases that have already been emitted. Those Native nations that begin to plan for this future now will be better prepared than those who only respond when the disasters arrive. The Swinomish Climate Change Initiative, for example, is building bridges between tribal and local governments in Washington’s Skagit River Delta in its climate change adaptation plans, such as moving roads and other infrastructure out of the way of coastal flooding. The West Coast has become the cutting-edge region for climate change planning and renewable energy, and the tribal communities in the region (such as Swinomish) are on the cutting edge of this work. Zoltán Grossman is a professor of geography and Native American and World Indigenous Peoples Studies at The Evergreen State College in Olympia, Washington. 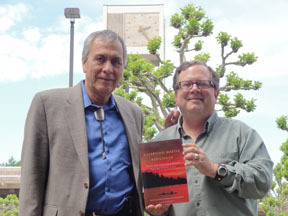 Alan Parker is director of the Northwest Indian Applied Research Institute and a professor in the graduate MPA program at The Evergreen State College. 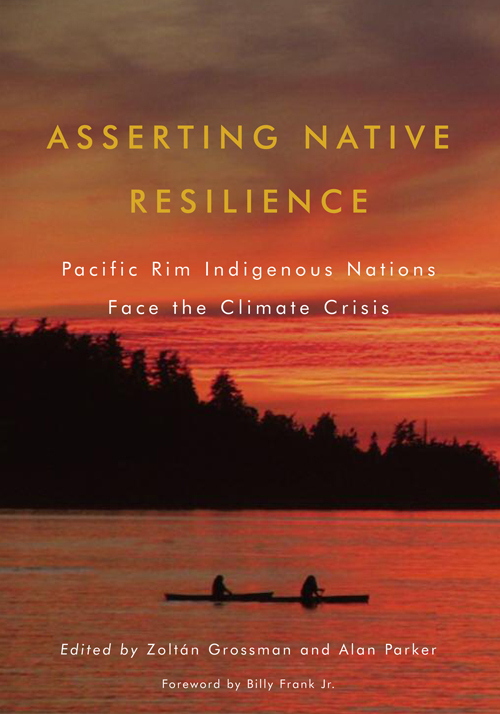 Their book, Asserting Native Resilience: Pacific Rim Indigenous Nations Face the Climate Crisis is available for purchase here. Book editors Alan Parker and Zoltán Grossman. This interview is crossposted on the First Peoples blog. We're pleased to welcome author Bonnie Henderson to the OSU Press blog. In her book Strand: An Odyssey of Pacific Ocean Debris, she traces wrack collected on a mile of Oregon beach, some of which had travelled from as far as Hokkaido, Japan. 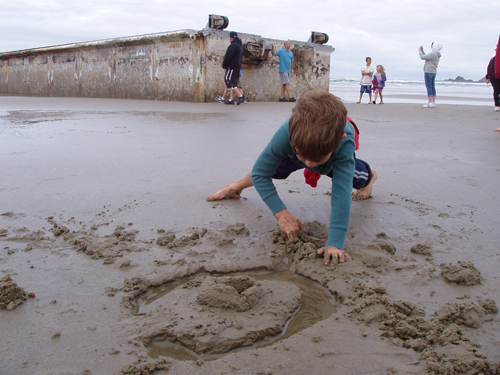 Today she reflects on the tsunami wreckage that has begun to wash up on Oregon's coastline and on what the future might hold for Oregon. The photographs were taken after large quantities of flora and fauna, including potentially invasive species, were scraped from the sides of the dock. 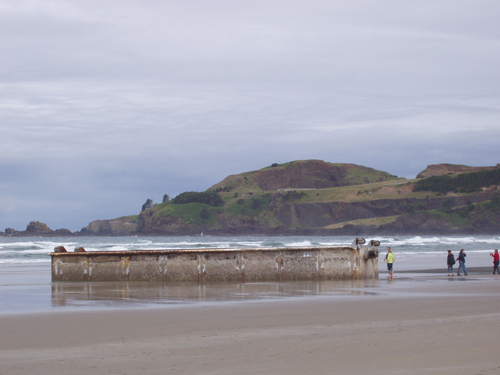 A large concrete dock, wrenched from the port at Misawa, Japan, by a massive tsunami 15 months earlier lands on the beach north of Newport, Oregon. A columnist f rom the local paper gives me a call. He’s struck by what he sees as a lack of reverence by tourists and locals for this object, which to him represents the thousands of lives lost in that cataclysm. He’s interested in a quote from the author of Strand: An Odyssey of Pacific Ocean Debris. I believe he thinks I missed the point. I tend to think he did. The debris from the March 11, 2011, tsunami has sparked great interest on this side of the Pacific in the stream of garbage that circulates in the North Pacific and that sometimes gets stuck in what’s known as the Great Pacific Garbage Patch. Many more people are now attuned to the North Pacific Gyre, a collection of currents that move like a river in the ocean in a great clockwise pattern around the northern Pacific Ocean. The gyre has always carried durable debris, notably the glass floats that Japanese fishermen used to use in great quantities and would lose or would intentionally discard, to make room in the holds for fish, before most of them switche d to plastic floats. Since the advent of container shipping and the explosion of plastic manufacturing, the quantity of plastic garbage in the gyre has exploded. Fish eat it. Birds, skimming the ocean’s surface, eat it, or they dive and eat the plastic-stuffed fish below. Most such debris floats just under the surface of the water, and thus floats at the speed of the current. Some—the dock from Misawa, notably—rides higher in the water and thus gets an assist from prevailing winds, which blow it faster than the speed of the water. The Pacific Ocean is vast. Debris that lands in the water immediately starts to spread out, and scientists now estimate that the debris from the 2011 tsunami in Japan now covers an area equivalent to three times the area of the continental United States. That’s part of the science story. What about the reverence? There’s a science story there too. Certain geologists and seismologists in Japan had been predicting a mega-quake of this kind for that part of Japan for several years, though their warnings had not been taken seriously by the Japanese government. Japan is no stranger to earthquakes, but the last major one in this particular location was in AD 869. We have a similar situation in the Pacific Northwest. There is no longer any doubt that similar seismic events—just as big, just as devastating, triggered by the same kind of collision of tectonic plates—have occurred here in the past and will occur here in the foreseeable future. Right here, from southern Vancouver Island, B.C., down to Eureka, California, or—in the cast of a partial rupture—from about Coos Bay down to Eureka. The last one was much more recent than AD 869; it was just 312 years ago, in January 1700. Humans living on this coast at that time—those who survived the event—memorialized it in their stories. And the earth recorded it in layers of estuary mud and sediment and ocean sand. With its history of frequent earthquakes, Japan has developed an infrastructure that is better prepared for such events than that of any country in the world. Still, as many as 20,000 lives were lost in the March 2011 event—with thousands still counted as missing, there is no definitive tally. The vast majority of those deaths were caused not by the earthquake but by the tsunami that followed close behind. It seems to me that the best way to honor those lost souls on this side of the Pacific is to take seriously the mirror-image threat that we face and to do our best to save lives here. We can prepare for it by moving schools and hospitals out of the inundation zone and by rebuilding bridges to withstand a magnitude 9 earthquake. Those bridges will be a lifeline for people fleeing the coming tsunami after the earthquake rumbles its warning. To ignore the science and fail to prepare here is to devalue the lives of our fellow humans claimed by another tsunami in another country on the other side of the Pacific. Docks, yes. Plastic water and soda bottles, certainly, and plastic toys and containers and items of all kinds. Boats. Wood from houses. All this and much more will find its way into the North Pacific Gyre after the tsunami here—whether it strikes this year or in 50 or 100 years. Some of that debris from our houses and businesses and parks and schools may eventually get blown onto the beach on northern Honshu, or maybe Hokkaido, and beachcombers there will no doubt have the same range of reactions our fellow citizens have had to the dock from Misawa, from annoyance to curiosity to reverence. But none of them will doubt that the kind of event that sent this debris from the West Coast of the United States to the coast of Japan can happen there. They know it can. They have felt it, have seen it. And they know it will happen again. Bonnie Henderson is currently at work on a book about how we know what we know about earthquakes and tsunamis in the Cascadia Subduction Zone.